Updated: Page 3 has been updated to include an official AMD response on the Brisbane performance issues we've been seeing. AMD confirmed an increase in L2 cache latency in order to support a move to larger cache sizes in the future, which may or may not happen. The rest of the article remains unchanged. Last week AMD sent us samples of its first 65nm processors, codenamed Brisbane, and it was a step towards being competitive with Intel again. The 65nm shrink yielded AMD's most efficient desktop processor to date, but it's still a far cry away from what Intel is able to accomplish with its Core 2 processors. We didn't mention this in the original article, but all of AMD's 65nm CPUs are considered to be Energy Efficient (denoted by the letters EE in the table above). With its 90nm chips, AMD specifically selected lower voltage parts to be labeled as Energy Efficient, but right now all 65nm parts are. For the sake of simplicity, especially as we compare to older EE parts, we will simply refer to these chips as 65nm chips. 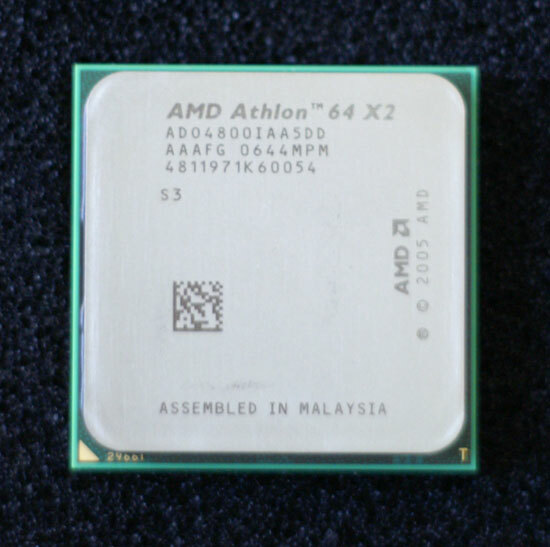 Note that the 65nm 4800+, 4400+ and 4000+ all use non-integer clock multipliers, a first for the Athlon 64 line. The implications for the end user are relatively minor, although it does mean that the model numbers will translate into more consistent performance graduations. In the past, having two chips running at the same clock speed but with different cache sizes meant that one would be faster only in those applications that could use the extra cache. Despite support for non-integer clock multipliers, all AMD chips still only support integer memory dividers, meaning that only CPUs with even CPU multipliers can run at DDR2-800. 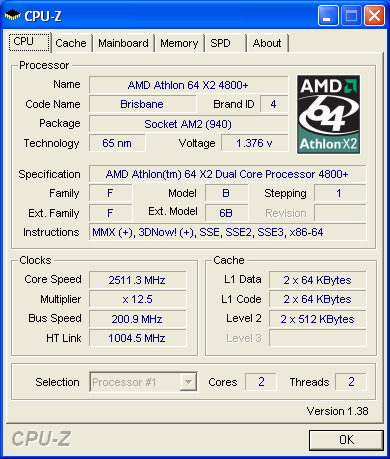 All odd clocked (5000+) and half-clocked processors (4800+, 4400+, 4000+) run at a slower than DDR2-800 speed, even when set to DDR2-800 in the BIOS. AMD wouldn't discuss whether or not this would be addressed in the future, but if it is we'd have to wait for at least another silicon revision. By now, none of this is new information, which brings us to why we're here today. In our original 65nm article we noticed a performance disparity between AMD's 65nm and 90nm processors, yet we had no official response from AMD as to why; today we have that answer. At the same time, we wanted to take a look at one of the half-multiplier chips and add it to our performance and power graphs, not to mention include some lower cost Intel CPUs per your requests. We've also got some more insight into the die sizes and power consumption figures we reported in our last article. In a sense, we're tying up loose ends with this piece, and shedding more light on AMD's 65nm cores than we originally did in our first, quick preview. AMD - Best CPU at doing nothing. I doubt many PC enthusiasts place much importance on CPU power consumption. If they did Intel would never have sold any P4 chips. With Video cards drawing 200+ watts per card, a 65 nano AMD chip is a sweet piece. From my perspective, this is the first AMD 65 nano chips and like most process drops there is little performance gain just in lowering the nano size. AMD has a lot in the pipeline and as it arrives I suspect PC enthusiasts will be quite satisfied with both the CPU options and performance. You're right, enthusiasts don't care about power consumption at all. We care about performance and overclocking ability. The average user does not need a faster CPU. Also, many enthusiasts work at IT depts making decisions what architecture to go for. Quote: I doubt many PC enthusiasts place much importance on CPU power consumption. If they did Intel would never have sold any P4 chips. That is where you are wrong. Say it after me: Million-dollar-marketing-campaign. Not the best product wins, but the best advertised. Think back to P4-times: Some average I-know-that-I-have-to-press-the-big-button-to-make-my-compie-start-Joe would enter a big (online) store like DELL where his only choice was a P4 - end of selection. Asked why he should buy it he would receive something like this: It has 3 REAL GHz, other manufacturers have _only_ about 2GHz. And then he would buy. PS I'm no AMD-fanboy. One has to clearly admit that Intel did a marvellous job with it's Core2. Only reason to buy is aforementioned power consumption in idle (my PC is idle 90% of the time) und the nice low price. No offense, but the moment one takes into account the fact of average PC spending >90% of time at idle, well, C2D eats X2's dust.